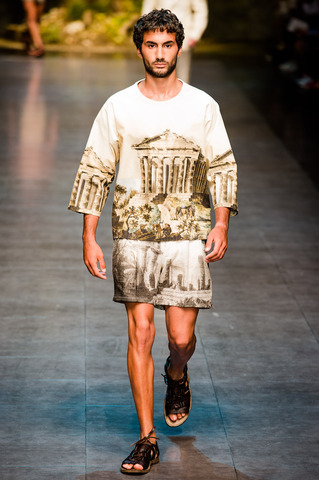 “Enchanted Sicily” was the title Dolce & Gabbana gave their collection, but what we saw was actually a timely departure from the overtly folkloric tone of the duo’s recent collections. So, just imagine your favorite nursery rhymes characters coming to life within the glorious world of fashion this fall. It was said that the two designers had a massive break through with the women ‘fantasy theme’ collection during the release of their previous collection last month. 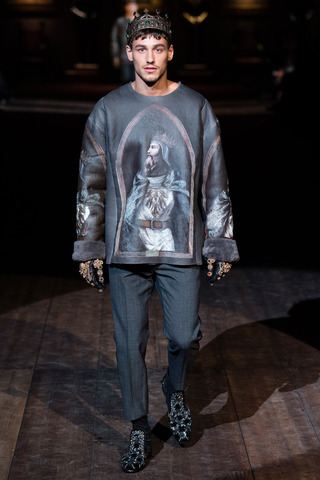 Here, it was their female consorts who inspired the embroidery and gilding, the gothic appliqué, The fashionable designs resembles foxes, owls and swans embedded sequins of various forest animals and luxurious giant fur coats with added hoods, resembling ‘Little Red Riding Hood’ and even black gowns with patterns of keys. The men theme is slightly more rustic, focusing on the cross-cultural historical crossroads, displaying the seven Norman kings who swept down from the North (inspired by The Hunger Games maybe?) Well, one things for sure this unique fashion craze is the walk all over social media. Most ‘fashionistas’ and various fashion designers are calling it ‘an inspirational/ mystical creation’.